With a new federal government committed to reconciliation with Indigenous peoples, and with the duty of federal departments to consult with legitimate First Nations clearly upheld by courts in Manitoba, the NCC needs to agree that the time has come to do just that. As a federal body with land holdings, the National Capital Commission (NCC) knows it has a duty to consult with legitimate First Nations when it disposes of lands where Indigenous people are claiming title. Furthermore, this duty to consult is not optional, as demonstrated by a recent dispute in Winnipeg over the Kapyong Barracks. The Department of National Defence owned the barracks, a vacant but highly valuable piece of real estate in Winnipeg’s urban core. When that department attempted to sell the land for development, legitimate First Nations in the province claimed land rights and took the federal government to court for not consulting them in the resale. The case was resolved during the recent federal election when the former prime minister agreed not to appeal the First Nations’ case to the Supreme Court of Canada. Why should this be a cautionary tale for the NCC? 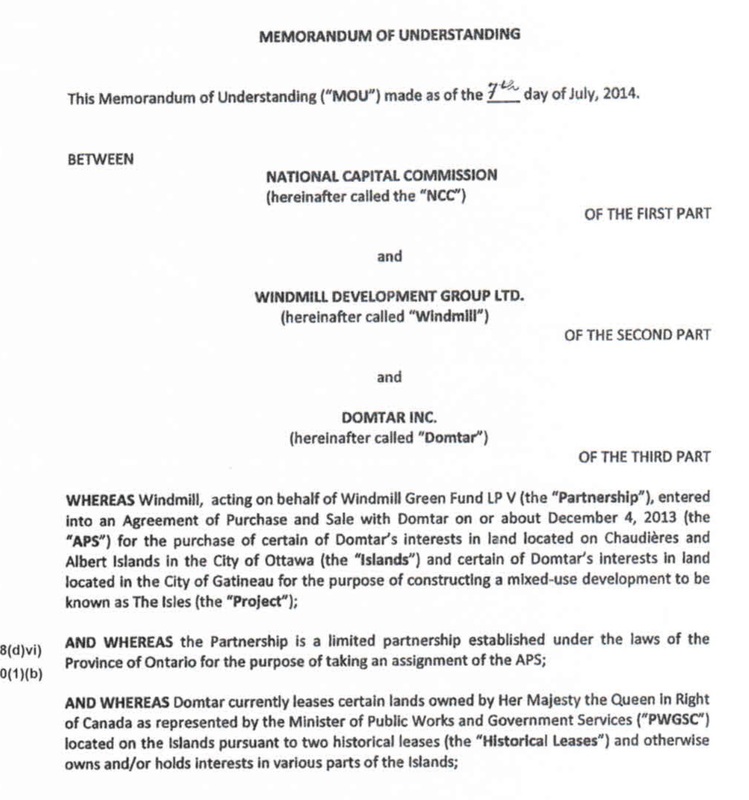 On July 7, 2013, the National Capital Commission (NCC) signed a Memo of Understanding (MOU) with Domtar Inc. of Montreal and Windmill Development of Ottawa regarding sale of the so-called Domtar lands on Chaudière and Albert Islands in the Ottawa River. Based on an Access to Information Act request, the NCC has now released parts of that once-secret agreement. Although whole pages of the MOU are missing from the version obtained through Access to Information, it is clear from what is now in the public domain that the NCC’s duty to consult with “Aboriginal groups” figures prominently in the MOU. Since then, the NCC has not met the conditions attached to its support. It has not conducted consultations with Indigenous groups or individuals, nor has it even acknowledged the call in August 2015 from legitimate Algonquin First Nations for discussions about the future of Akikodjiwan, a sacred site that consists of Chaudiere waterfall, three islands in the Ottawa River, and part of the shoreline in Gatineau. That request was also conveyed to the NCC by the Assembly of First Nations–Quebec Labrador, on November 19, 2015 and is to be conveyed by the National Chief of the Assembly of First Nations after a special chiefs’ assembly passed a binding resolution in early December 2015. The NCC continues to be the kingpin in sale of the Domtar lands that Windmill Development Group seeks to own. The company does not own these parcels because their transfer, as leases, from the NCC to Windmill Development Group was tied to the City of Ottawa’s rezoning of the land from parkland to commercial/residential. That rezoning remains subject to appeal in the Ontario court system. The next court date is in late January 2016. Here’s something else the public needs to know about the proposed sale of these lands by the NCC. The MOU asserts that both the NCC and Public Works and Government Services Canada own lands on Chaudière and Albert Islands that the departments have leased to Domtar. This relationship between the former industrial tenant on Chaudière and Albert Islands and the federal government is clearly stated on page 1 of the MOU. For all these reasons, the NCC is bound to consult with legitimate Algonquin First Nations about their interests in securing title to unceded and unsurrendered Algonquin territory, and to a sacred site that now deceased Algonquin Elder William Commanda spent 30 years of his long life advocating for. He called the islands and the magnificent Chaudière waterfall site Asinabka. It is this site that a new generation of Algonquin First Nations is seeking to turn into a Cultural Park and Historic Commemoration Site under an Algonquin-controlled institution. It’s time for the Minister responsible for the NCC, Melanie Joly, to begin nation-to-nation talks with them.